The Fly Agaric is commonly perceived by North Americans as a toxic and hallucinogenic mushroom. 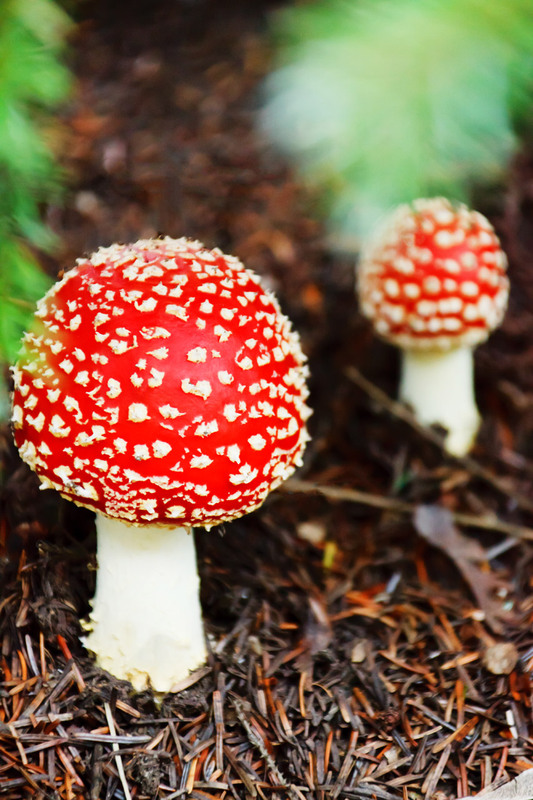 The fungus has played a role in religious anthropology, and research surrounding the Fly Agaric has generated a surge of controversy over the past 50 years. John Allegro (1970) determined Amanita muscaria to be the central figure involved in Christian art depictions of the Tree of Knowledge, and he theorized that Christianity itself focuses not on Jesus and the Gospels, but on the basis of worshiping fertility mushrooms. Further intrigue has evolved surrounding Amanita muscaria and the presence of the mushroom in historic prints of Christmas cards. Did you know that the origins of several common yuletide traditions have originated from historic uses of Amanita muscaria? It seems unusual, but this photogenic fungus can answer several questions regarding the origins of common Christmastime traditions. The following image depicts Amanita muscaria at wintertime, however we often do not see the Fly Agaric during this time as they are covered by snow. What is the significance or the relevance of the Fly Agaric in this image? Good Luck in the New Year! A German Christmas card illustrated by Anonymous. Used under the Creative Commons Attribution 3.0 Unported license. Several European cultures link the Fly Agaric to a symbol of luck, and the fungus is often depicted in illustrations with horseshoes and four-leaf clovers (Marley 2010). As Amanita muscaria were collected and dried during the summer, they would be shared and consumed in the winter months as they were easily stored for the winter (Marley 2010). To have dried Fly Agarics remaining by the arrival of the Winter Solstice and Christmastime was a lucky year. Therefore, Amanita muscaria is often shown in Christmas and New Years cards to wish others good luck over the Winter Solstice and in the New Year (Marley 2010). The Fly Agaric is of Siberian-Beringian origin, and later spread and thrived in variety of climates and was observed as a symbol of fertility for the Pagan Winter Solstice (Geml et al 2006; Ratsch and Muller-Ebeling, 2006). The Winter Solstice is seen as a time of rebirth, which later became the reason for Pope Julius I to pick December 25 as the date for the celebration of Christmas (Alcock 1991). It is thought that Pope Julius, along with the first Catholic Roman Emperor Constantine, wished to deter people from celebrating the Winter Solstice, and placed a Christian holiday in December to compete with Paganism (Alcock 1991). Both holidays have strong emphasis on rebirth and new beginnings with the passing of the shortest day of the year, and they have a strong presence of Fly agaric-related traditions. Another figure depicted in the German Christmas card above is a mystical creature known as a gnome or Nisse. Nisse are widely associated with Amanita muscaria and are placed around the house during the Christmas holidays; a tradition celebrated by Nordic and European countries such as Denmark, Sweden, and Germany (Main 2013). Nisse are seen everywhere throughout the holidays; think of the current fascination with ‘Elf on the Shelf’ in North America, although this tradition has been practiced in Europe for hundreds of years (Raedisch 2013). The Nisse – often depicted as small Santa Claus-like figures – would bring gifts, including dried Amanita muscaria that would be consumed or smudged around the house, to celebrate the Winter Solstice (Raedisch 2013). Fly Agaric mushrooms have a symbiotic relationship with several species of pine, spruce and fir trees and are often found directly beneath evergreen trees (Geml 2006). For convenience, Fly agaric would be placed in the branches of evergreens to dry for future consumption in the winter months. This drying process resembles that of the first Christmas trees displayed in homes (Main 2013). Prince Albert, husband of Queen Victoria, was reported to be the first to introduce a Christmas tree into their home at Windsor (Alcock 1991). This was thought to replicate and celebrate the symbiotic relationship between Amanita muscaria and evergreen trees, and was thought to bring good luck to the family while they celebrated the arrival of the New Year (Main 2013). Gifts were placed under the tree after they were wrapped in brightly coloured, often red and white, packaging to further imitate and celebrate the Fly Agaric mushroom (Main 2013). Fly Agaric (Amanita muscaria). Photo by H. Krisp. Used under the Creative Commons Attribution 3.0 Unported license. There are conflicting opinions on the consumption of Amanita muscaria, as most North American field guides claim the mushroom to be poisonous or toxic (Rubel 2008). However, Fly agaric mushrooms have been consumed and prepared by Europeans and Nordics regularly, with no deaths occurring (Rubel 2008). Dried Amanita muscaria are eaten without any preparation, resulting in a hallucinogenic trip from the muscimol and muscarine toxins in the mushroom caps (Whelan 1994). The fungus can also be parboiled, which completely removes the psychoactive properties (Whelan 1994). Several Siberian tribes have taken on another quite unusual strategy to prepare Fly Agaric in the past: as reindeer farms and Amanita muscaria are both very common in Siberia, the mushroom is a tasty treat to the reindeer, that also enjoy a type of high after eating the mushroom (Marley 2010). The urine from those reindeer were collected by tribes, and then consumed for a less potent hallucination experience with vivid dreams (Marley 2010). Hallucinations and vivid dreams are believed to be the reason why the nordic tribes in Siberia believed reindeer could fly at Christmastime (Marley 2010, Main 2013). Most think that consumerism and marketing were the reasoning for Santa Claus bearing the bright red and white uniform, however, he had been wearing those colours long before Coca-Cola began using him in their marketing in the 1930s (Belk 1987). Even Santa Claus, who is thought to be derived from a Siberian Shaman or Danish Nisse, has ties to Fly Agaric. His coloured robes replicate the colours of Amanita muscaria and in folklore, he is from countries that commonly consume the mushroom (Main 2013). Santa Claus, an almost god-like figure himself, has also been depicted as a representative of fertility and luck; he has historically been depicted as an androgynous figure that helped unmarried women pay for suitors (Belk 1987). His association with reindeer, and links to giving out the dried Amanita muscaria mushrooms or presents wrapped in red and white as gifts, are compelling evidence for underlying Pagan celebrations of a mushroom hiding in plain sight during a Christian holiday. There are several underlying Pagan themes in Yuletide celebrations, perhaps because of the timing and the date that Julius Caesar chose to place Christmas Day. As there is overlap in the dates of the holidays, there is reason to think that origins of many well-known Christmas holiday traditions were derived from the Pagan Winter Solstice. As Pagans believe in the worship of nature and the celebration of fertility, one must take note that common symbols and ties to Santa Claus and Christmas can also be linked to the celebration of Amanita muscaria, as both are figures of fertility, rebirth and good luck. Unknowingly to most, there are several traditions celebrated in modern North American homes that relate back to historic celebrations involving Amanita muscaria, a mushroom that North Americans perceive to be deadly. Next Christmas season, be mindful of Amanita muscaria in your family Christmas and New Years activities, as you may also unknowingly be celebrating a hallucinogenic fungus. Alcock, Joan P. 1991. The Festival of Christmas: Oxford Symposium on Food and Cookery: Feasting and Fasting: Proceedings. Edited by Harlan Walker. The Oxford Symposium. Allegro, John M. 1970. The Sacred Mushroom and the Cross: A study of the nature and origins of Christianity within the fertility cults of the ancient near east. Hodder and Stoughton Ltd. 253 pp. Belk, Russell W. 1987. A Child’s Christmas in America: Santa Claus as Deity, Consumption as Religion. The Journal of American Culture 39: 87-100. Geml, L., GA Laursen, K O’Neil, HC Nusbaum and DL Taylor. 2006. Beringian origins and cryptic speciation events in the fly agaric (Amanita muscaria). Molecular Ecology 15: 225-239. Marley, Greg. 2010. Chanterelle Dreams, Amanita Nightmares: The Love, Lore, and Mystique of Mushrooms. Chelsea Green Publishing Company. 263 pp. Ratsch, Christian and Claudia Muller-Ebeling. 2006. Pagan Christmas: The Plants, Spirits, and Rituals at the Origins of Yuletide. Inner Traditions/Bear and Company Publications. 224 pp. Raedisch, Linda. 2013. The Old Magic of Christmas: Yuletide Traditions for the Darkest Days of the Year. Llewellyn Publications: Woodbury, Minnesota. Rubel, William and David Arora. 2008. A Study of Cultural Bias in Field Guide Determinations of Mushroom Edibility Using the Iconic Mushroom, Amanita muscaria, as an Example. Economic Botany 62(3): 223-243. Whelan, Cristal. 1994. Amanita muscaria: The Gorgeous Mushroom. Asian Folklore Studies 53(1): 163-167. This work by MacKenzie Bouchard is licensed under a Creative Commons CC-BY Attribution 4.0 International License.